COME TO JERUSALEM: MARCH FOR THE TEMPLE MOUNT IN THE JERUSALEM MARCH! 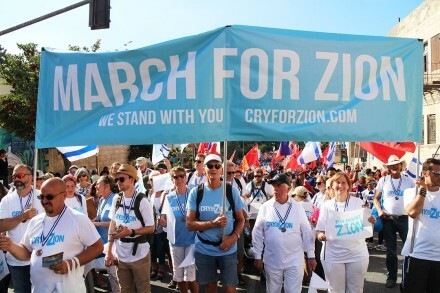 Join the annual Jerusalem Municipal March and show not only your solidarity with Israel, but march with Cry For Zion to support Jewish freedom and rights on the Temple Mount (Mt Zion). Jews and all non-Muslims are currently forbidden to pray on the holiest place in the world, contrary to numerous Supreme Court decisions and human rights. The Temple Mount is the place where Almighty God has placed His Name and His presence forever. It is the epicenter of God's dealings with mankind, destined to be a House of Prayer for all nations. Where is the outcry from the Bible-believing community across the world, supporting the Jewish people against Islamist pressure and world opinion? Since our group will be part of the big Jerusalem March, we have to register and pay for everyone that participates in advance. Cost: $20/person, includes General Admission. Either buy a Cry For Zion T-shirt (50% discounted price exclusively for March participants. ), or bring your own light-blue shirt without text or message on it. Time: 1:00 pm, September 27, 2018 during the Feast Tabernacles / Sukkot. Meeting Place: Sacker Park, Jerusalem. Look for CRY FOR ZION banner.